This post comes from one of our international partner offices, Bruce Clay India, which Bruce visited this month to meet with the team and deliver his SEO Training course. On 12th February 2018, Dhananjay Kumar from Max Life Insurance​ fulfilled his five-year long dream of meeting Bruce Clay in person. 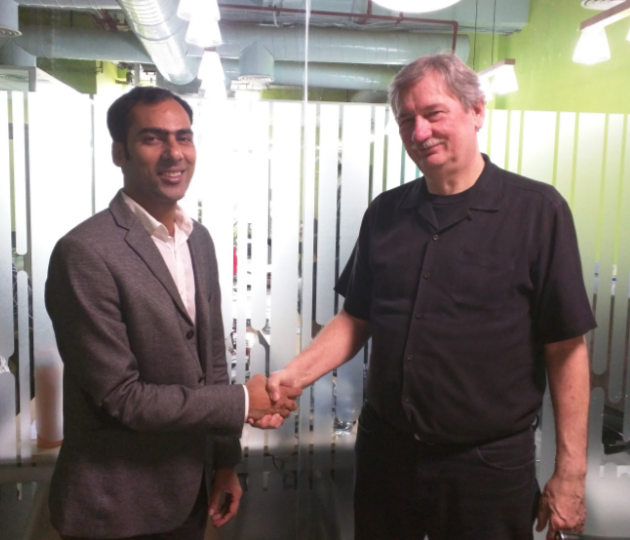 Dhananjay, who was the lucky winner of Bruce Clay India’s SEO Contest, arrived at BCI’s Gurgaon office to claim his prize — an exclusive 30-minute Q&A session with the Father of SEO, Bruce Clay. Dhananjay, who calls himself a big fan of Bruce Clay, is passionate about SEO. With an eager clasp of hands and the words, “Can’t wait to get started,” he shot off questions for Bruce, which the SEO guru answered with his characteristic composure and just the right dose of humor! The excerpt below contains Bruce’s SEO advice on issues from overcoming compliance restrictions to press releases, voice search, local market confusion, PWAs and more. Dhananjay: Being an insurance firm, we cannot use words like Best, Top and other superlatives. How do we rank for such superlative terms? Bruce: You have a compliance issue. Therefore you cannot use the terms “Best Insurance Company” or “Top Insurance Policy” anywhere on your website or ads. We have the same problem in US with Banking and Insurance companies where you can’t use words like cheap, best, etc. You need to check with your compliance team on what else should you not use. If you remember linear distribution from the SEO Training, you can use the word ‘best’, but not to describe your business or product. Get the two words ‘your business’ and ‘best’ in proximity without violating the compliance. It can be done by saying things like, “Many insurance companies claim to be best but not us.” It can be used in the schema description, meta title and meta description of the page. Also check with your compliance team if using the ‘taboo’ words (Best, Cheap, Top, etc.) in meta titles, meta descriptions and meta keywords violates compliance in India or not, and act accordingly. Dhananjay: Can we rank on our competitors’ brand queries? Bruce: You can, but it’s unethical and ill advised. You cannot use a person’s brand against them. If you do, they can take legal action against you. If you want rank for your competitors’ keywords legally, you can use your competitors’ brand names in a review. But you can’t sell anything on that page or even try. Also, you might be obligated to link to the competitor’s website. Dhananjay: How effective are press releases? Bruce: Press releases are an awareness tool to create buzz about a product, a company or even a keyword. For example, your company creates a new type of insurance. A press release will encourage some people to go online and search for it on Google. If you are the only one with that type of insurance, it will help you get more traffic. Social media and press releases are mechanisms that excite people to make them search. Once they search, your PPC and organic handles the rest. Dhananjay: Google hasn’t given any recommendations for voice search, so how do we leverage voice search? What could be the best SEO strategy for voice search? Bruce: First of all, search for your product by voice. Sometimes, accents also make a problem for voice search. The phone can’t understand certain words in different accents. Voice search may not work best internationally. Hows, Whats, and Wheres — use long-tail, question-based, 4+ word queries. Ensure that you answer the Hows and Whats of your product within your content. Mobile, voice and local are the big three focus points. Google’s search index is now mobile-first, so that’s very important. We know voice search is important as the top three products sold last Christmas were all voice products. Local is important because it helps Google make money. Remember that local helps national, so strengthen your local first. So focus on all the three areas for best results. Dhananjay: A fraud site with a similar domain name as ours used to rank in our place. We set that right with the help of legal. However, they claimed 70% of our local listings, and I am unable to fix it. Bruce: Your lawyers can indicate that there is “Market Confusion” (it’s the proper term) over the domain name and make them surrender their product. If you find that a company with a similar domain name is taking away your traffic, you can claim that domain. For local listings, you can indicate to Google that your local addresses/listings have been hijacked. A Google representative should be able to help you with getting the domains/listings back. You can also file a DMCA (Digital Millennium Copyright Act) complaint with Google, a form that is easily available online. All you have to do is give Google your copyright number or your trademark number to file the DMCA (just to be on the safe side). Dhananjay: How does PWA (Progressive Web Apps) fit into our SEO strategy? Bruce: PWA is still changing. There are two types of design decisions you can make, as I mentioned in the Masterclass — Appy or Webby. The general feeling is Webby. The general way in which PWA works is this: when someone opens a website for the first time, it’s installed. It installs an envelope and loads the content in the envelope. The next time Google will know it’s a PWA and will load the content. The content will still be responsive. To learn more about PWAs, type “site:google.com Progressive Web Apps” on Google. Dhananjay looked thrilled after his interaction with Bruce and receiving his valuable SEO advice. And why not? After all, how many people have the privilege of meeting the most well known proponent of SEO on the planet! If your company is stuck with how to do SEO or digital marketing, or is facing compliance issues, you can drop the Bruce Clay India team a note at sales-in@bruceclay.com. Siddharth Lal is the managing director of Bruce Clay India, established in 2009 and based in Gurgaon, India. Siddharth Lal is the managing director of Bruce Clay India. Notable accomplishments include: Named one of India’s Top 100 Digital Marketers (2017) on the Pluralsight Digi100 List by Paul Writer. Instrumental in Bruce Clay India's winning the Most Trusted Marketing Partner award at DMA Asia CMO Choice Awards 2017. Advisor and mentor on the TV series "UNICORNS – Start-Ups of the Internet" by NDTV Profit/Prime, November 2015 to May 2016. Recipient of the Most Talented Social Media Professional in India award from CMO Asia in 2014 at the sixth edition of the Global Youth Marketing Forum. Speaker at various industry SEO forums such as ad:tech New Delhi, SES New Delhi and the National Institute of Advertising. Read posts by Siddharth on his author page. Pavan: Thanks for commenting. If you can, come and participate in a full SEO Training! Our next dates are 16–20 July 2018 in the Los Angeles area. Another pack of chops from the Mighty Bruce! Hoping to participate in these contests and meet Bruce soon. Best example when “problem” and “solution” come together in one place and start a conversation. Nice information! I have truly enjoyed reading your Question and answers and I agree with you for the most part. Thank you for sharing. Steer your own SEO game and always ensure you critically analyze and question everything you read or hear. SEO is an industry where we have to fill in a lot of the gaps. It’s easy to presume others more senior or established have filled in those gaps correctly because of rhetoric. seeking more knowledge in this industry. And can you please help me about latest ranking factors?? i want to know google is updating their algorithm and many websites is going to down . what is the main factor of SEO now? Informative Q&A. I liked the way Bruce answered press release question. It worked for my firm also and we too got too much buzz in the market. I must say Dhananjay is very well planned with his questions and Bruce is absolutely fantastic on his expertise. The local listing factor is very important and even I also faced the same problems like Dhananjay faced for his company. I am delighted to have this quality post where many things are sorted out just by reading the entire questions answers sessions. Awesome SEO advice and contest. These question and answers are useful for the SEO persons who are seeking more knowledge in this industry. Bino: We’re glad you found it useful. Thanks for reading! Hope you’ll subscribe for more posts and learning. Great point, Bruce. I’ll be recommending these types of seo tweaks next week. Thank you! Dhananjay: Thanks for bringing questions that were well thought out and useful for many. We wish you the best! Thanks “Bruce Clay Inc” for this opportunity. No words..it means a lot. Tawseef: Thanks for reading this. What questions would you add? Informative and need to add some more related questions as well.